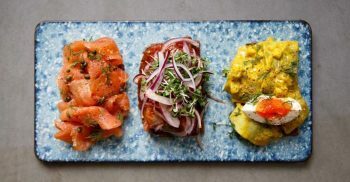 Ekte, meaning genuine or real in Norwegian & will offer a varied Nordic dishes. The Scandinavian-influenced Restaurant & Café/Deli is open daily throughout the day for both eat-in or to go. followed by a lesson on how to pickle, store & traditionally serve Nordic Herring. (for an additional £15.00, guests can join the Head Chef Robin after the class for schnapps, herring & more inspiration on how to serve their own herring). Bookings can be made via email to filli@ektelondon.co.uk or call us on 0203 815 2666. Full pre-payment for the event is required, with a 48 hours cancellation policy.